Push the limits with a CFMOTO ATV. 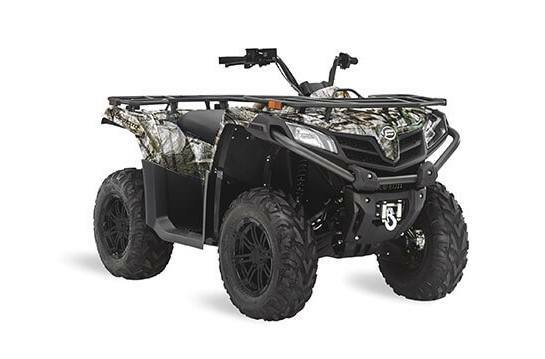 Each model in CFMOTO's full line of all terrain vehicles is engineered to give you the smoothest, hardest working ride. With a comfortable and ergonomic riding position, you will always have a commanding view of the terrain in front of you. Whether for sport or utility, our each machine in our ATV lineup will handle the biggest jobs and get your through the toughest terrain. WARNING: CFMOTO recreational vehicles are intended for off-road use only, and can be hazardous to operate. Read Owner's Manual and all product labels before operating. Never operate on paved roads. Operators and passengers must wear a helmet, eye protection and protective clothing. Operators must be at least 16 years old with a valid driver's license. Passengers, if permitted, must be at least 12 years old. Always use seat belts, cab netting and doors (if equipped). Never operate under the influence of alcohol or drugs. Avoid excessive speed and sharp turns, and never engage in stunt driving. Check state and local laws before operating on trails. Take a safety training course before operating. Contact your CFMOTO dealer for more information, call the ATV Safety Institute at 1-800-887-2887, or go to www.atvsafety.org. 82.6 in. x 43.3 in. x 45.3 in.